"Are you kidding me? It used to be worse in that warmup pool?!" In May, 2011, I moved to Charlotte with every item I owned packed into the bed of my seasoned F-150. I arrived a full day before the Charlotte Ultraswim...the first meet of the next chapter in my swimming career. Just thinking about that time in my life makes me smile, and I will never forget it. A few things stood out about that meet. First, I swam decently well for an in-season meet, and second, I experienced the worst pool air quality in my life. I don't say that lightly, because I had an asthma attack during a meet at a different pool in 2009. This pool was far worse; thankfully I was able to run outside into the parking lot and recover as needed. It was so bad, there were often more people outside catching their breath than were in the warmup pool. The warmup pool clouded up like milk, became greasier than sweat, and the air was borderline toxic. My eyes and throat burned. Everyone was miserable, including the coaches. That small, four-lane, 3-foot deep lap pool was the primary warmup pool for the entire meet. 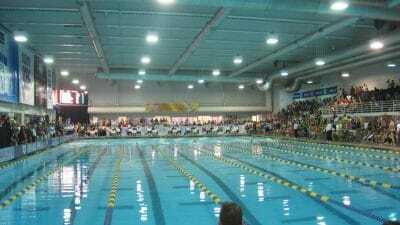 The meet had 850 swimmers, ranging from regional qualifiers up to Michael Phelps himself. Rumor has it, the year before, he actually refused to come back unless they improved the air in the warmup pool. Enter Paddock Evacuator. The only problem was it wasn't installed in the right location, so the air was horrible. Outside in the parking lot, I was talking with my fellow swimmers--total strangers at the time--about trying to warm up in there. One guy told me it was far worse in previous years. "Are you kidding me? It used to be worse in there?!" Evidently so. This is the Ultraswim warmup pool in 2013. When I said it gets packed, I meant it. Swimmers eventually enjoyed decent air quality in the warmup pool because the Evacuator was moved to the right location and fully operational. But the water was far from "quality"...super high chlorine to try and address the insane bather load just made things worse. The water was so cloudy we could hardly see the tile a mere three feet below our faces. By the last day, I could not see my own hands. Suffice it to say, this meet was known for being overcrowded and having a horribly inadequate warmup pool. The Ultraswim brings some of the best swimmers in the world, and the fans pack the house. Yet the competition pool usually only sees 8 people at a time. Now let's get to the real story. I had recently moved back to Virginia at the time, but returned to Charlotte to attempt earning a 2016 Olympic Trial cut in the 50 meter freestyle. When I arrived, I went to warm up in the 50 meter pool. The water was decently clear at the time, though I could not see all the way across the pool. When the finals session was about to begin--so Katie Ledecky could smash another record--we all had to vacate the competition pool. So I moved into the dreaded 4-lane warmup pool. It was the oddest thing...not only was the air quality pristine in there, but the water was clear. The water felt different too...it felt like the water at Queens University down the road. Orenda treated the Queens pool, but I never appreciated the difference the enzymes made. They have a big swim team, but have never had the 850-swimmer bather load that this little pool did. 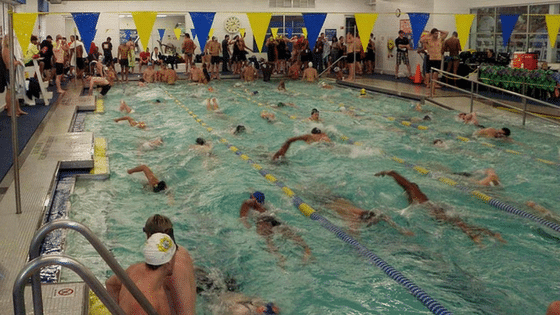 I realized I was waist deep in a liquid science experiment: enzymes vs. a bather load of 850 competitive swimmers. And I can guarantee you many of them peed in that pool. I thought I knew what Orenda's enzymes could do to water quality, having worked for Paddock Evacuator. We promoted them as part of the Evacuator package, because a deep clean of a pool and its system helps pool operators maintain good water quality. But until I was in that warmup pool, even I did not fully understand the power of these enzymes. I finished my warm up routine and headed out to the sponsor's tent. Lo and behold, Harold and Monica from Orenda were there. This confirmed what I assumed, but I went up to Harold to ask him anyway. "Are you treating the warmup pool with enzymes?" I asked. "Why do you ask?" Harold replied, grinning. "Because it's clear. It feels different. 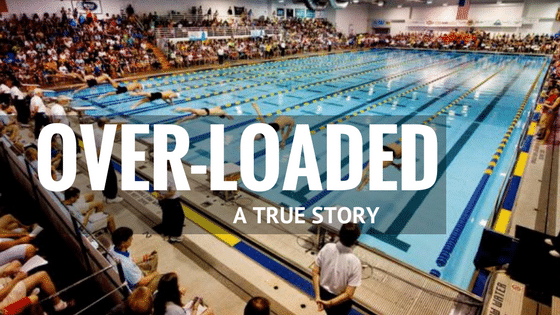 It's better than it ever has been, and I've been swimming in this meet for years." Our conversation grew. Come to find out, Orenda wanted to treat the competition pool too, but the staff at the pool wouldn't let it happen. All the better, I thought. It showed such a contrast between the two bodies of water. Thanks to the Evacuator, the air quality remained pretty good throughout the meet...but the water quality in one of the two pools deteriorated far more than the other. Care to guess which pool looked worse on the last day? Hint: it was the one which, for most of the day had only 8 swimmers at a time in it. Yes, it got cloudier, but I could still see 25 yards across. Compared to years past, when I could not see my own hands, it was obvious. That meet was when I became a devout believer in the power of enzyme water treatment. We don't need complex science to grasp what enzymes do. Enzymes devour bather waste and get it out of the water. That's that. After experiencing it first-hand, I would put these enzymes up against any swimming pool bather load. Orenda welcomes challenges...so bring it on.